BOSTON, January 21, 2013 – Personal bankruptcy filings in Massachusetts decreased more than 18 percent in 2012 from a year earlier, according to a new report from The Warren Group, publisher of Banker & Tradesman. 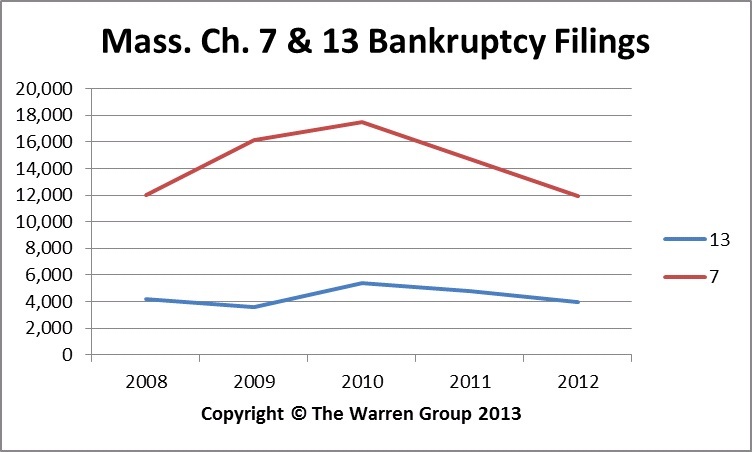 There were 11,964 Chapter 7 bankruptcies filed in Massachusetts last year, down from 14,716 filed in 2011. Chapter 7 of the U.S. bankruptcy code is the most common option for individuals seeking debt relief, and accounted for more than 74 percent of Massachusetts’ bankruptcy filings last year. People filing under Chapter 7 bankruptcy can eliminate most debt after non-exempt assets are used to pay off creditors. In contrast, Chapter 13 requires debtors to arrange for a three- or five-year debt-repayment plan. Filings under Chapter 13 of the U.S. bankruptcy code dropped 17 percent to 3,991 in 2012, down from 4,813 in 2011. 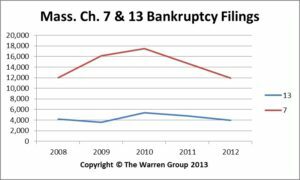 Chapter 11 filings, which are used for business bankruptcies and restructuring, also declined in 2012. Filings decreased 29 percent to 152, down from 215 in 2011. A total of 16,107 filers statewide sought protection under Chapter 7, Chapter 13 and Chapter 11 of the U.S. bankruptcy code in 2012, down from 19,744 in 2011. Chapter 13 bankruptcy is also known as a reorganization bankruptcy. Chapter 13 bankruptcy is filed by individuals who want to pay off their debts over a period of three to five years. This type of bankruptcy appeals to individuals who have non-exempt property that they want to keep. It is also only an option for individuals who have predictable income and whose income is sufficient to pay their reasonable expenses with some amount left over to pay off their debts. Chapter 11 bankruptcy is typically used for business bankruptcies and restructuring. It is not commonly used by individual consumers since it is far more complex and expensive to pursue. It allows businesses to reorganize themselves, giving them an opportunity to restructure debt and get out from under certain burdensome leases and contracts. Typically a business is allowed to continue to operate while it is in Chapter 11, although it does so under the supervision of the Bankruptcy Court and its appointees.